Hi everyone, I’m having trouble with the laptop at the moment so can’t log on to the Blog. Everything I typed yesterday has disappeared so I’ll have to start again later. I’m typing this on the iPad but the photos are not on here of course!! Hope to get back to normal later!! Hooray, normal service has been resumed!! All this ‘winding down’ is very tiring! 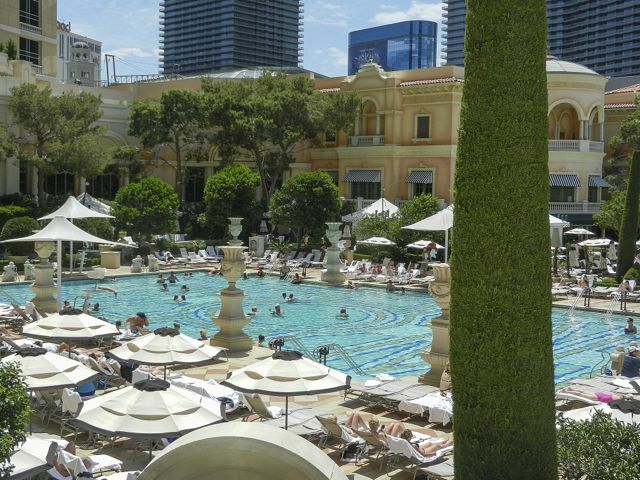 We are up and at the pool by about 9 a.m., have some breakfast, spend about three hours there, in and out of the pool and then it’s off gambling, shopping and dining. When is a person supposed to rest!!?? As you would expect, it was very hot again this morning. It’s 8.00 p.m. now and it’s still 100ºF. Just like yesterday we were up and round the pool bright and early and had granola parfaits for breakfast. There is a pool service so we don’t even have to move off our beds, we just order what we want from the ‘pool waitress.’ I’ve discovered today that they serve a cucumber French 75!! Would it be wrong to be drinking alcohol before midday? Decisions, decisions! It was time to return ‘the beast’ and Margaret to the rental company today. So we took them back before heading off for dining, gambling and shopping. This year in three weeks we travelled 3,712 miles. Even though Margaret had her ‘moments’ it was still sad to say goodbye. When we had dropped the car off we went round to the rental office to speak to Fred. You will remember he was so helpful when we collected the car three weeks ago and heard of the trouble we had last year. Well, he was serving someone but as soon as he saw us he rushed over and shook hands and wanted to know how our holiday had been and if the car had been okay. We thanked him and said everything had been wonderful. He was so pleased that we had taken the time to speak to him. We were supposed to have gone to see Mac King, the magician, this afternoon but the show was cancelled due to unexpected circumstances which was a shame. We had VIP seating and Si was terrified that he would be asked to go on the stage so I think he was secretly pleased it was cancelled. 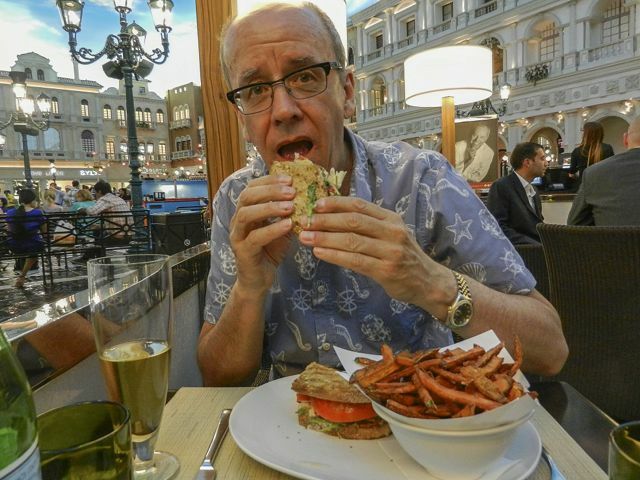 So, as our afternoon was ‘free’ after all, we went to have lunch and check out the shops at The Venetian and Palazzo hotels. 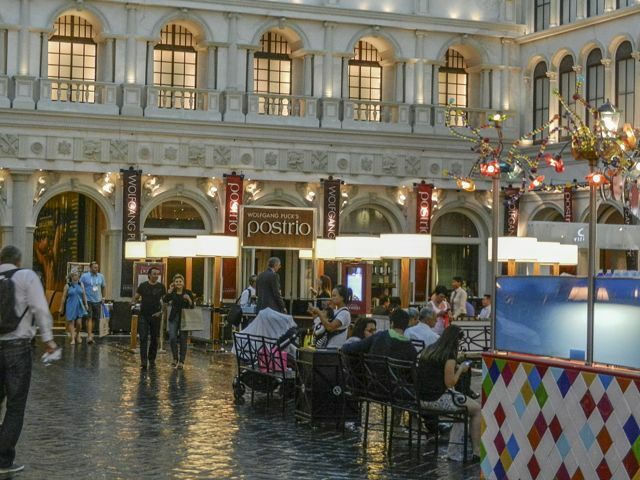 We ate at another one of our favourite Wolfgang Puck restaurants, Postrio in St. Mark’s Square of The Venetian. As usual, the food was delicious. When a restaurant serves Plymouth gin you know it’s something special and Postrio serves Plymouth, enough said! 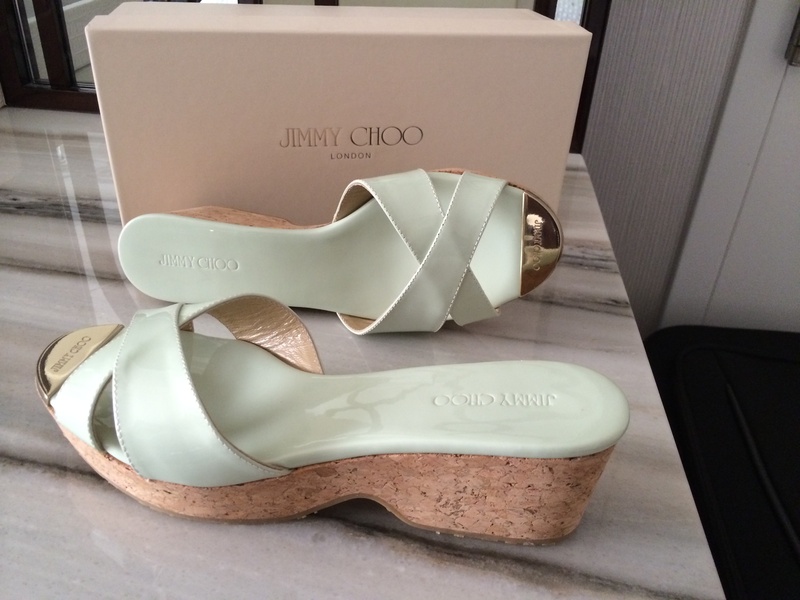 Well, at the shops in the Palazzo Hotel they have a Jimmy Choo shoe shop and JC had started their season sale today! How can anyone who knows me well expect me to walk past a JC shop with a sale on! Well, of course I couldn’t, I just had to go in and take a look. It wasn’t my intention to buy shoes on this trip but when a girl is confronted with a 50% shoe sale what is she expected to do? Well, buy, buy, buy of course!! Due to a shortage of suitcase space I only bought one pair of summer shoes. 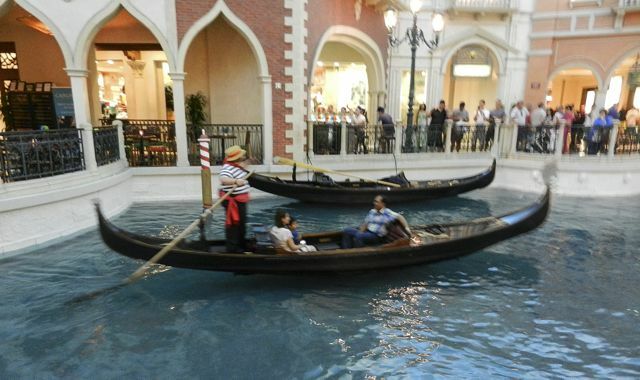 You can also take a gondola ride at The Venetian. We’ve done that previously, it’s very pleasant as the Gondolier sings as he rows! We had great gambling success at the hotels, we tripled our money! Let’s hope it continues. 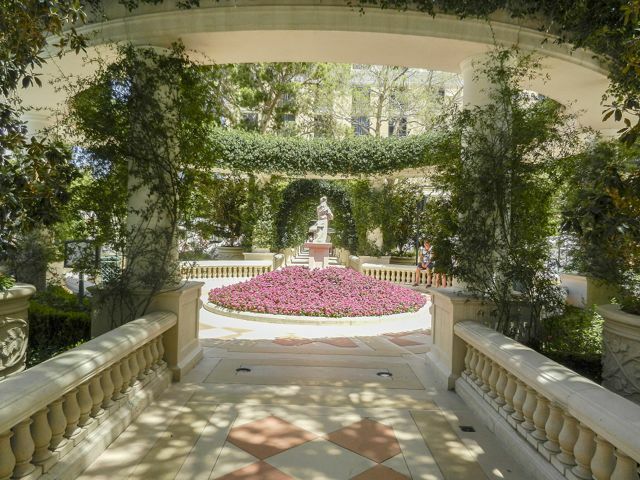 We got a cab back to Bellagio as it was rather too hot and too far to walk and when we told the cab driver where we were going he said “oh, going home then.” That’s just how we feel about the Bellagio. 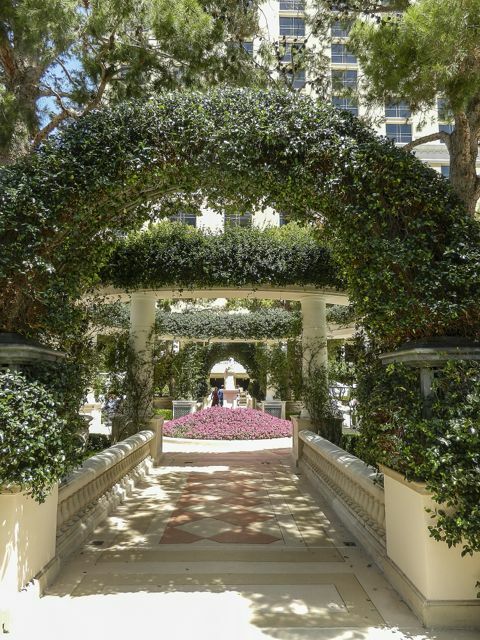 We’ve been coming here a long time and every time we walk into the lobby we feel as though we’ve come home. Everything’s so comfortable here, it’s like putting on a pair of old slippers! Extremely annoying Ann but thankfully we are back up and running!